The production is proudly sponsored by Myerson Solicitors LLP? Olivier Award for Best New Comedy 2015.?Mrs Thatcher meets The Queen!!! A satirical/comedic play examining the relationship between Margaret Thatcher and Elizabeth II. Moira Buffini?s celebrated new comedy speculates on what the world?s most powerful women really talked about behind closed palace doors. MARGARET Thatcher, like numerous prime ministers before her, had regular, private audiences with the Queen. What was said remained a closely guarded secret of course, however, I can recall rumblings in the media at the time, suggesting they didn’t always see eye to eye on certain issues. But what did these two powerful women really talk about? Award-winning writer Moira Buffini takes that idea and runs with it in this classy comedy set inside the corridors of power. This really is clever stuff, without being dry or self indulgent and Buffini certainly doesn’t gloss over the fact Mrs T was, politically, something of a “Marmite” figure. In this production, expertly directed by Carole Carr, you get two actresses playing Maggie and both Caroline Knight and Fiona Primrose sound remarkably like the real thing. Close your eyes and you could be in the presence of the so-called Iron Lady. We also get a double dose of He Majesty, with Dawn Flint and Rachel Horobin sharing the crown. Now, if you’re an actor looking to test your versatility look no further than Handbagged. Mark Edgar and Jamie Sloan take on a variety of roles from Denis Thatcher to Nancy Reagan snd te end result is much hilarity. Sloan’s portrayal of the stick like former First Lady is a show stealing performance from a man who was born to be funny. This is the Garrick’s production of the season for me – do not miss it. TWO of the most powerful women in Britain, the Queen and her 1980s? Prime Minister, Margaret Thatcher, get together in Moira Buffini?s award winning play, Handbagged. It is at Altrincham Garrick Playhouse where four talented actors play Thatcher and the monarch when young and older with film backdrops of the real Iron Lady. Its talk of special relationships rings bells in 2017! Buffini only speculates about weekly meetings between the two, but with insight into their characters, the play could be surprisingly near to the truth. Caroline Knight as the older Thatcher captures the former PM?s belief that she, a grocer?s daughter, is equal to the Queen. Dawn Flint?s older Queen remains as gracious and aloof as ever. The portrayals of them earlier show Rachel Horobin as a sovereign wary of taking on the responsibilities of office and Fiona Primrose, an ambitious and clever Maggie. We are reminded of the assassination of Airey Neave and Mountbatten which affected them both personally. Then there is the Brighton Bomb, the miners? strike, and the Falklands war. Two men ? Jamie Sloan and Mark Edgar – take on the roles of husbands, palace servants and ministers of state with versatility and humour. They interact with each other and the audience like pantomime dames and have everyone in stitches. The two ladies who apparently view each other with mild dislike, always remain frostily polite. That is until Maggie?s demise when the Queen substitutes a whisky for eleven years of tea. 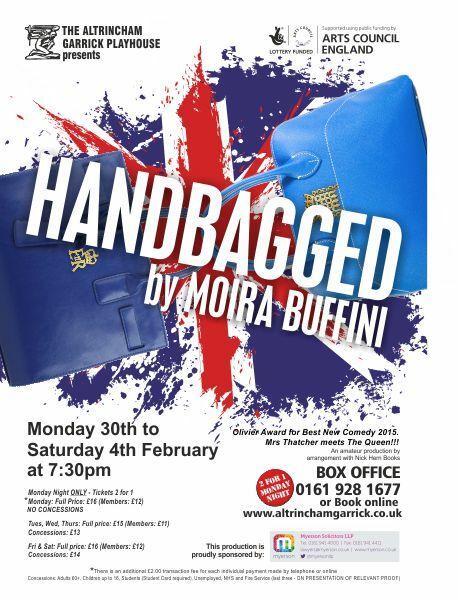 Handbagged is at Altrincham Garrick Playhouse until February 4. For tickets telephone 0161 928 1677 or book online.